Ruby + Swallow: We're back! Hi Rubies, we're back! It is so wonderful to be back in the world of blogging after a few month's break, and to finally launch our brand-spanking-new-dot-com website! We've been furiously busy these past few months making sure that our new look is everything we could want it to be, and more, perfecting it down to every last small detail. As you can see, not only has the blog drastically changed in it's look and feel, but now we've upgraded to be a dot com site. Fancy right? 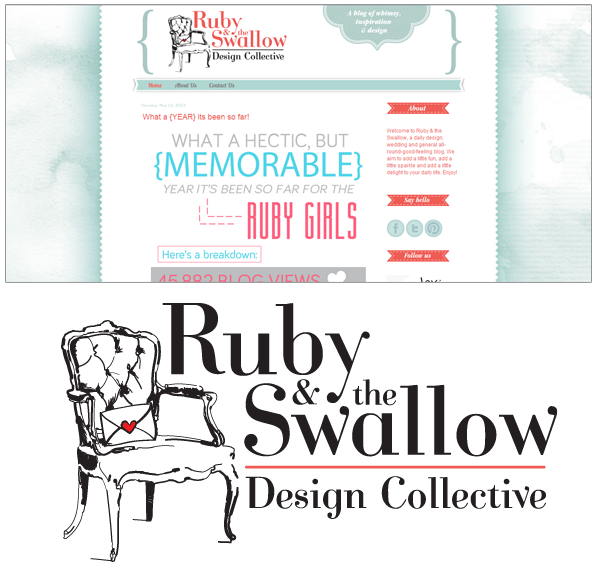 We've also dropped the 'the' in our brand's name and simplified it right down to the essentials: Ruby + Swallow. For those of you joining us for the first time, (and just for old time's sake) this is what our old blog looked like. It was pretty, feminine, whimsical and unassuming, and we were in love with it. Over the past year and a half, we've had loads of compliments from our readers, peers and friends regarding the design and so for a long time it was what we loved and wanted. Before we started up the blog, we worked really hard on our logo and brand - messing around with loads (and we mean, LOADS) of different font, icon, colour and composition options until we designed one that we were both obsessed with. 2013 brought many exciting and wonderful changes for the Ruby Team, and we decided that our blog needed an extra injection of energy and a face lift - a total makeover really. We have grown so much as people in the last year and half, and we wanted our blog to reflect those changes. And that's what you're looking at now (more on that later this week). So what exactly has changed around here? Let's take you on a little tour of our new website. As you may (or may not) know, we're obsessed with weddings and events. Being graphic designers, this obsession naturally progressed into a lot of wedding and event stationery design. So in our new website, we've included a brand new portfolio page, which you can find a link to on the top navigation bar. This is a showcase of all the wedding stationery work we've done in the past year and is such a point of pride for us. Although our portfolio gallery isn't quite complete just yet, you can click on some of the images to get a closer look at our work. Our portfolio page works closely with our client list on the left navigation panel. We are avid users of social media and have made our accounts more reachable with a new navigation bar on the right panel. We've included links to our Ruby + Swallow Facebook and Pinterest pages so that you can follow us there. You can also click on the links below the photographs of each of us to get to our individual Twitter and Instagram accounts. We have realised that you, our readers, want to get to know us personally and so we will not be using our generic Ruby Twitter account anymore. Not an instagrammer? No worries, you can still take a look at our pictures on the left navigation panel. Cool right? We've tried to make the site easier to navigate with our category section in the right navigation panel. Click on the links that interest you to take you to specific posts. You'll be able to find posts about all things wedding, trends, fashion, beauty, Durban, and personal posts. All our content from the past year is still around - so don't worry, you'll still be able to find them using our search tool on the left. So, now that you know what's changed around these parts, we'd just like to say a huge welcome back! We're so excited to get blogging again, letting you all into the wonderful pieces of our lives around Durban. We have some awesome things lined up for the next few months, so stay tuned! One last note: we would love to hear what you guys think about our new look. It's really important to us what you think - so please give us your opinions. Facebook us, tweet to us (Kim or Filipa) or even leave a comment below - we'd love to hear from you!